ReclaiMe is an easy to use, effective tool for file recovery. 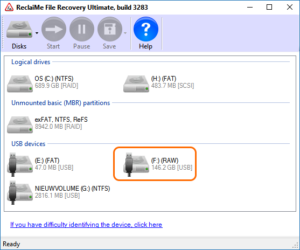 Unformat type recovery using ReclaiMe is quick and hassle free. Generally you can recover your data in less than an hour. Modern unformat utilities do not actually unformat the hard disk like the unformat DOS command did. Instead they analyse the disk and build a virtual file system in memory to copy data to a safe location. When I use the term ‘hard disk’ on this page, you can also read , SSD, SD Card, USB key, USB External hard drive etc..
To recover data from such a disk, an additional disk is required to copy the rescued data to. As we will be using Windows software (ReclaiMe), we need a running Windows installation. If you need to recover data from an unbootable disk, it needs to be attached to another PC on which you can perform the recovery. In unformat type scenarios you can usually recognize the drive by it’s drive letter. If you can not, and the drive you need to recover data from is on an external disk, simply select the physical device. Refer to this page for an explanation on the different disk and drive icons.